Do iOS Apps Crash More Often Than Android Apps? Crash analytics firm Crittercism released a new study this week, claiming that iOS applications crash more often than Android applications. After monitoring over 215 million apps across a wide range of different platforms, the report concluded that iOS 5.0.1 had the highest rate of application crashes. 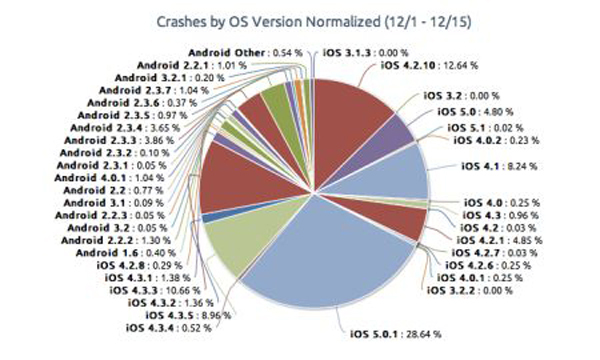 iOS in general also had more app crashes than its top competitor Android. These are interesting numbers that contradict the long held belief that iOS and the apps that run on it, are more stable than that of Android’s. So why such a large number of crashes on iOS? One belief is that iOS has more apps than Android and therefore will have a greater number of app crashes. Another is that iOS 5.0.1 is still new and experiencing more issues than usual. No matter the reason, it’s safe to say that you’re always going to experience app crashes, regardless of the operating system you use. How often do you experience and application crash and what OS system are you using?